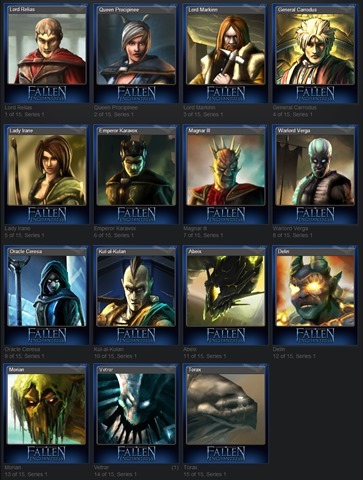 Some of you have noticed that Fallen Enchantress: Legendary Heroes has added Steam Trading card support. If you aren’t familiar with the trading cards you can get an overview here. Basically, you get these cool cards when playing games on Steam. You can then trade them, or craft them into badges. which give you XP on Steam where you can earn even more stuff. Lets give a big kudos to Leo who is an incredible artist at Stardock who made these cards. Here’s a look at the cards you can collect. How nice for all those owners of FE and LH on Steam. Shame you're not showing the same care for those of us who bought FE direct from you. The Cards look great. Good job Leo. FE doesn't have a game badge, these cards are solely for Steam users who are LH owners. If you don't own LH, I'm not seeing where your gripe has any basis. And the cards do look great, some of the best looking ones I've seen so far. Yes, because Steam trading cards would do you a world of good if you're not using the game on Steam. Very good you lot - gold stars all round. I'm pissed because Stardock are pimping themselves out to Steam while ignoring their own direct customers. If you bought FE through Steam you get a 50% better discount (in the UK anyway) on LH than if you bought it from Stardock direct, and now they fall over themselves to give them these cards too. But you can do it. Go to acc_name/badges/ click on one of the cards, that you have (new page will open) and than again click x2 on the card that you wish to open in full size. Right click and you can save image's url. When the wow factor has mostly worn off for these Steam Cards, could you give pictures of them away so people can still appreciate the art? They don't need to have tradeable or Steam Badge value to be worth having pictures of them, and it would be a nice goodwill gesture to the community. The cards are part of a commercial campaign that a lot of games participate in, to stimulate the Steam community so the potential amount of customers on steam that will notice the games increases. Stardock participates, as does, for example, Squad, with their Kerbal Space Program, and Betheseda, with Skyrim. I am very glad Stardock participates, and spends some small amount of money on a commercial campaign that encourages people to buy and /or play their very good fantasy game. More revenue for Stardock is something I much appreciate, because they gave me Galciv2, and War of Magic, which led Brad to make two a statement, lets not forget that, that I would be getting the next two "expanions" free, which turned out to be Fallen Enchantress and Legendary Heroes. A bold statement indeed, and if there ever was a company that cared for its customers and stood up for their products, it is Stardock. Because I, in fact, had those two for free. Suggesting, therefore, that Stardock does not care about their customer base or a part of it are somewhat far-fetched. The ball, mr. Woffle99, is in your court again. Good luck. Well bully for you Barrynor. The fact that you got your expansions for free suggests that Stardock USED to care about their customers, but I have a feeling they regret that promise and have changed their tune now, since those of us who bought FE from them during beta are now getting rather shafted. The fact that I thought Stardock did repay customer loyalty makes it even more disappointing that they are not prepared to offer those direct customers (and early adopters of FE) the same discount on LH that they are offering to Steam customers. Given that, after Steam take their 30%, they would still make MORE money out of us by offering it at the same price makes it all the more galling. LH should never have been $20 to FE owners in the first place anyway - that was just Stardock trying to pump us to make up for the fact that they were giving it to Elemental owners for free. And yes, I bought Galciv 2 from them direct too - doesn't mean I owe them anything. I made it quite clear in my final post in the other thread that this is a Steam sale, and we're not matching any prices as both previous owners and new purchasers are getting quite a discount on Steam. I understand your point, but i'm just not sure it's worth throwing in the towel over. Aren't we talking like a 5 bucks difference here or something similar? LH is a great game, regardless of whether it's an expansion, standalone or whatever. You get get it for under 20 bucks. That's cool. Ok so some other person is going to get their hands on it cheaper than you because they bought on steam, or they were a WOM early purchaser or for whatever other reason... good for them. You've made the point that customers will not by direct from Stardock if they miss out on deals like this. That's a valid point and i'm sure Stardock will take it on board. Is it a bummer for you, yeah a bit... but why let that affect you in such a negative way? More sales of LH is good for all customers at the end of the day. No you're right. It's very hot here and I've let this irk me a little more than it probably should have done. I've been waiting for a sale to buy LH and the fact that I'd have to pay more despite buying early and direct from Stardock just doesn't sit right with me, no matter how much I tell myself it's only just over $5. Anyway, point made (hopefully) to Stardock - I'll leave everyone alone now and get on with playing the other games I bought in the Steam Sale. Get some shade. Its hot this summer. Hehe, dude, he used "bully" as a term denoting "good", slang from across the pond. *shrugs* I can't know everything, I'm not even a native english speaker. - GalCiv 2 owners who bought the GalCiv 2 game and expansions individually on Impulse didn't get ported over to SDC, whereas folks who bought GC2 Complete did. That's a penalty to the early adopters. - I wish Stardock games would follow the example of mount and blade and allow you to move the directory out of Steam and run the game that way if you so desired. I want to have that option "just in case". Both of these gripes are fairly minor, the first will go away with GalCiv 3, the second won't until Stardock allows it like some other games do. From what I see Steam cards are another empty, no value item (just like achievements) that is supposed to drive compulsive people to buy more games as gamers are notorious for their "gotta catch 'em all" mentality. The whole thing is quite idiotic which means it's going to be a huge success. Well played Steam, well played. Great job on the cards Leo! You guys should put a board game out or something! Let his talents be seen more! I'm actually enjoying the system so far... for doing nothing other than leaving games minimized, I've made $8 so far on 34 items. A chunk of that was from a foil card drop (thanks, Portal 2!). I'm viewing it as Steam giving me a free game for using their service.